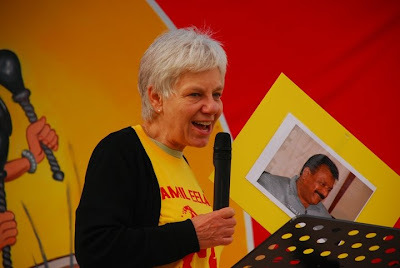 Could former Auckland City Councillor and lifelong "comm symp" Maire Leadbetter be showing solidarity for Tamil Tiger terrorists? Note Tamil Eelam T shirt and portrait of Tamil Tiger leader Prabhakaran. Maire is the daughter of Christchurch Communist Party leaders Jack and Elsie Locke and sister of Green MP Keith Locke, who also seems to associate with terror supporters. The SIS has been watching her since she was 11. Maire's the archetypal "red nappy baby" and has unfortunately yet to change them.